Every month on the 28 is a special celebration for Fudo Myo-O at many Fudo temples. The last one of each year, Osame .., is the most frequented, followed by the first one in January, Hatsu-Fudo 初不動. Bonfires are lit and the talismans from the year are burned, o-fuda o-takiage お札お焚き上げ. Takahata Fudoson Temple in Hino City. The Last Fudo Fire Ritual of the Year, Narita-san, Chiba Pref. The flames of Otaki-age (final burning of amulets), which light up the sky, say goodbye to the year. This ceremony is held in Naritasan Shinshoji temple every December 28. 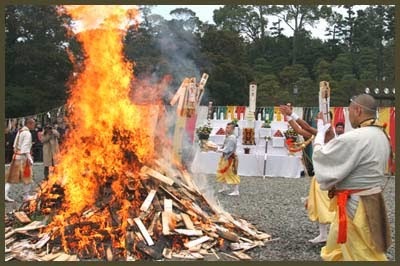 After performing a very old rite, people burn the talismans (Goma-fuda) which blessed us through the year and pray that make all evil spirits may vanish. This pile of "Goma-fuda" is called "Shito-Goma" and the ceremony is called "Osame-Fudo". After burning the "Goma-fuda" the people of Narita are ready to begin preparing for the New year. December 28. Kigo for mid-winter. 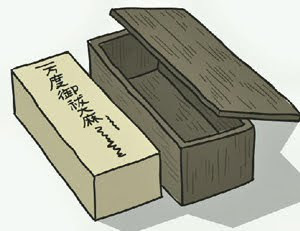 The box contains good luck talismans from a Buddhist temple. 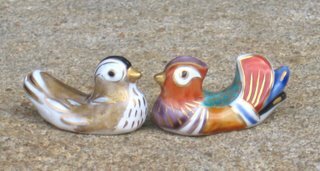 This haiku has the prescript, "Replacing charms" (fuda osame). The person in the scene is returning old talismans to replace them with new ones. Issa plays with the juxtaposition of old and new: charms and blossoms. The most famous O-haraibako was transported from the Great Shrine at Ise to distribute the new talismans to the believers all over Japan by special priests. Sometimes they also contained medicine for the people. The sanskrit word for harai　波羅夷 (purification) is parajika, paaraajika, the pronounciation has changed to harai.
. o-harai oogibako お払い扇箱 "Buying back fan boxes" . This is a hokku found near the end of Issa's haibun Year of My Life (Oraga haru) about his life in 1819. The hokku was written on or just after 12/21, the day before lunar spring began that year (Feb. 5, 1820 on the Gregorian calendar) and about a week before lunar New Year's. Probably the plum tree is a sacred tree located in the precincts of a Shinto shrine or Buddhist temple in Issa's home town, where the ceremonial yearend return of paper charms and talismans is taking place. At large Shinto shrines and at some Buddhist temples there were sheds of various sizes into which believers could place their bags and boxes of various old charms they'd received during the year so the charms could be sent back to the realm of the gods and Buddhas in a ritual bonfire. Most of the charms were Shinto prayers or Buddhist mantras written vertically on long thin pieces of paper that people pasted to the walls of their gate or front door or near their oven or placed in a small altar or shrine in the house as protection against negative energy from outside, and these often came in long thin boxes which could be used to hold the charms once they were taken down or became out-of-date, usually at the end of the year. 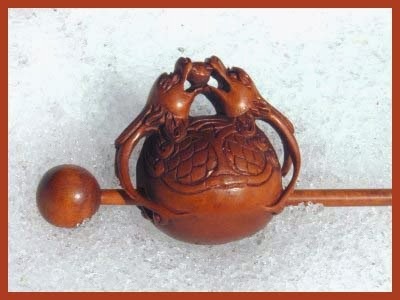 Soon new charms were bought, beginning with the first pilgrimage of the new year to the shrine or temple. Although Issa doesn't mention a shrine here, hackberry trees were often large and long-lived and were commonly regarded as god-trees. In Issa's hometown, however, the local shrine or temple apparently asks people to tie their bundles and boxes of old paper charms to the trunk and possibly the lower limbs of a different kind of sacred tree: a plum. It seems possible the shrine itself may have tied a large wooden collection box or boxes to the tree, but the image of people tying their boxes and packets onto the tree seems more natural and in accord with tradition. The exact reason for using trees as the collection place for old, out-of-date charms is unknown, but presumably it was linked to lingering shamanic beliefs in the ability of trees to act as connecting poles between this world and the other world, poles down which the gods descended when they appeared in the visible world. The blossoms appearing on the plum tree in the hokku also represent the descent of the plum tree god. Issa is impressed by the fact that the blooming plum tree is willing to bear the weight of all the boxes as it also goes about its work of putting out its blossoms. While one form of divine power descends in the form of blossoms another symbolically rises back into the sky in the form of the old charms. Issa generally didn't believe in superstitions, but he seems to be impressed by the strength and energy of the tree. At the same time, Issa may feel sympathy or pity for people who feel they have to spiritually weight down themselves and the blossoms of their heart-minds every year with sheaves and boxes of charm papers. Of course, placed near the end of Year of My Life, the boxes also suggest the heavy weight of Issa's own experiences during 1819, especially the loss of his beloved baby daughter. Perhaps he looks at the plum tree as a strong example or guide for him to follow during the coming new year.
. harae　祓 Purification Ritual .
. dondon yaki どんどん焼き burning old decorations . 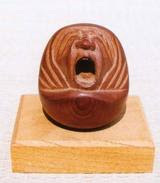 and usually also Daruma dolls which have served the purpose for the past year.